Posted in: 2 Shout-out-Looks. Tagged: Janine Tugonon, Miss Universe 2012, Wells Fargo. Looking more beautiful, Janine Tugonon is. 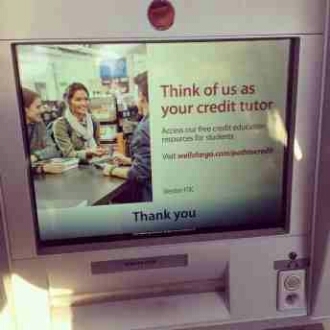 Janine on the screen of Wells Fargo's ATM around the US. …think of Janine Tugonon. And she will suddenly appear right on the machine’s screen (see left photo). You see, the Miss Universe 2012 1st Runner-Up clinched a gig with Wells Fargo to appear in one of their ad photos for the Path To Credit campaign of the bank. And the image now regularly appears in all of its ATMs around the US. I think it’s cool. And it only goes to show that she continues to get modeling jobs out there. Big or small, the important thing is that she’s eking out a living while still trying to look for her proverbial place under the sun. Just keep us updated always, Janine! The Latinas of Miss International 2014: Who are your Top 3? Posted in: 1 Pageant Pages, 2 Shout-out-Looks. Tagged: Aileen Bernal, Fiorella Ximena Peirano Medina, Michelle Bertolini, Miss International 2014, Vianey del Rosario Vázquez Ramírez, Zuleika Kiara Suarez Torrenegra. In any global beauty competition, the candidates from Latin America always seem to have the most attractive (and most prepared) set of contenders. And Miss International 2014 is no different. In fact, there are already potential winners in the list of almost-twenty joiners from the region. If you ask me, I would consider Vianey Del Rosario Vazquez Ramirez of Mexico, Zuleika Kiara Suarez Torrenegra of Colombia and Michelle Bertolini of Venezuela as the three best Latina delegates. But if I push for a Top 5, I would definitely include Aileen Bernal of Panama and possibly Fiorella Ximena Peirano Medina of Peru. Since there will only be a Top 10 during the finals this year, though, a good number of casualties in the Spanish-speaking bloc is in the offing. Posted in: 1 Pageant Pages, 2 Shout-out-Looks. Tagged: Bianca Guidotti, Miss International 2014, Sushi-Zanmai. 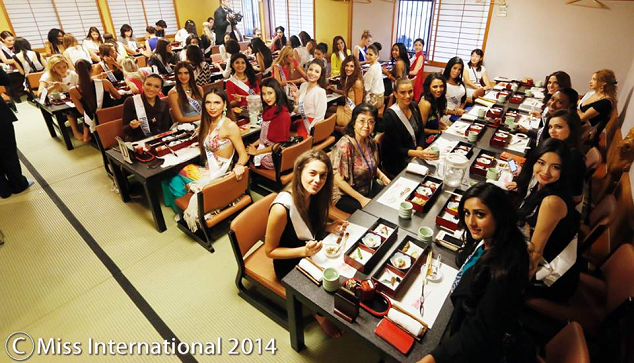 The Miss International 2014 contestants during their sushi party inside Sushi-Zanmai in Tokyo. 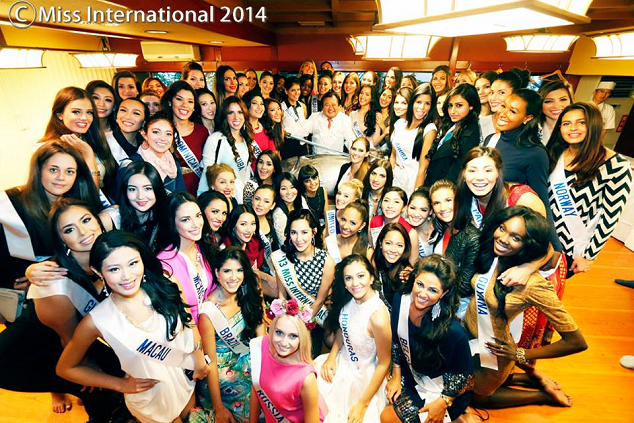 It was a happy tummy-filling sushi party that all the Miss International 2014 contestants went to last night. And they couldn’t be happier as every single one of them has been looking forward to something authentic like this from Day 1. After arriving at Sushi-Zanmai, they filled up all the tables and did not wait long for their dinner treats to be served. Never mind that the video cameras continued to roll even if they might be caught opening their mouth while eating the delicious food in their individual bento boxes. The experience was all worth it. Miss Philippines Bianca Guidotti (left) enjoying her sushi dinner with the ladies. Posted in: 1 Pageant Pages, 2 Shout-out-Looks. Tagged: Daryanne Lees Garcia, Miss Grand International 2014, Nawatt Itsaragrisil. Miss Grand International 2014 Daryanne Lees Garcia offering a rose to a soldier in Thailand's Muslim south. In living up to the vision and mission of Miss Grand International, recently-crowned winner Daryanne Lees Garcia was accompanied by Mr. Nawatt Itsaragrisil to start with the host country itself in spreading peace and goodwill. The two of them started with the Muslim areas of Thailand to forge friendships and hopefully strike a chord of unity. Sounds like a mighty objective at the onset. But without any sincere attempts to do so, efforts will only go to naught. Posted in: 1 Pageant Pages, 2 Shout-out-Looks. Tagged: Bench Ortiz, Miss Universe 2014, Miss Universe Philippines 2014, MJ Lastimosa. 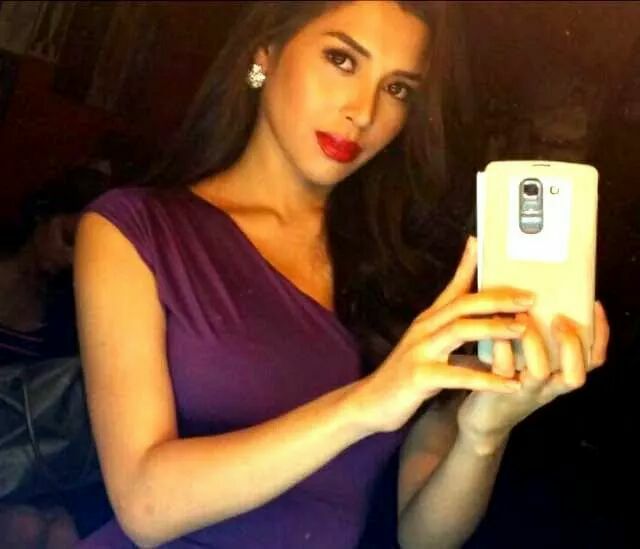 Just when everyone thinks that it’s all Miss International, Miss Earth, Miss Intercontinental, Miss Supranational and Miss World that we should be posting about nowadays, here’s a new one on our Miss Universe Philippines 2014 MJ Lastimosa who will actually be the last major pageant fighter to see action for the country. But that doesn’t meant cutting herself more slack in preparations. On the contrary, she continuously pushes herself to the limits in all aspects of training – be it in the gym with Bench Ortiz or in the make-up sessions with Gio Flores or the Q&A/Interview one-on-ones with Oli Sara. Posted in: 1 Pageant Pages, 2 Shout-out-Looks. Tagged: Bianca Guidotti, Miss International 2014. Okay, before you guys assume that I simply gathered all Bianca’s pics and placed them on grids to come up with a fresh topic for the day, there is a good basis for everything. These are just some of the comments I got from FB chats with other contestants about our Bianca Guidotti. If she keeps it up, I see every reason for her to become the Friendship award winner. 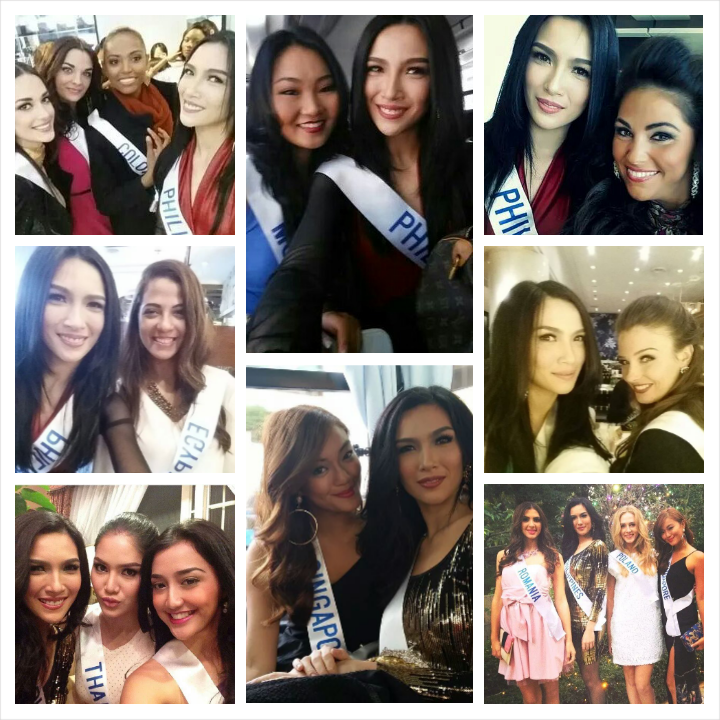 Miss Philippines Bianca Guidotti and Miss Netherlands Shauny Bult are like the best of friends in MI2014 now. They might even compete for the Friendship Award! Posted in: 1 Pageant Pages, 2 Shout-out-Looks. Tagged: Anastasia Kostenko, Donald Trump, Julia Morley, Miss Russia 2014, Miss Universe 2014, Miss World 2014, Rolene Strauss, Yulia Alipova. 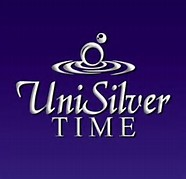 Due to the tight dates in between Miss World and Miss Universe, a different Miss Russia will go to London as a result. Yulia will be hard-pressed to take part in both MU and MW. The first of the twice-to-compete national pageant winners has finally caved in to the pressure of time. Miss Russia 2014 Yulia Alipova just couldn’t participate in both Miss Universe 2014 and Miss World 2014 with barely a month in between to move from one to the next. 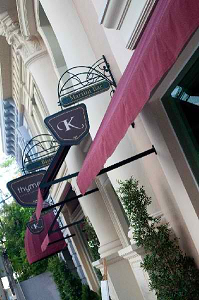 And guess where she is being sent? 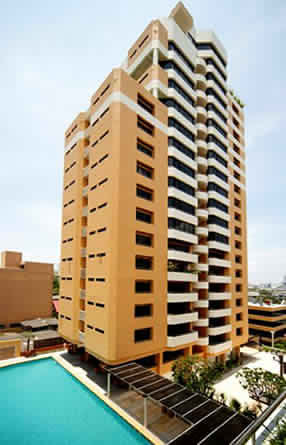 To Doral Miami, as expected. It’s a simple case of opting for Trump over Morley. The beneficiary of the vacated Miss World Russia slot is now 2nd Runner-Up Anastasia Kostenko. Miss World has now become Anastasia's gain. It makes me wonder how this turn of events will sit with the Miss World Organization. Only two possibilities, in my opinion. Either Anastasia will do well in London for goodwill’s sake or she will just be a candidate going through the motions of representing her country but without the slimmest of chances to even place. Whatever happens, we might get to see two separate Russian ladies being crowned for MU and MW next year. As for Yulia, she should figure out prominently in Miss Universe. After all, the Russian organizers have made it clear who is #1 for them. Pageant and politics. Really strange bedfellows, especially after the third wheel has been kicked out of the mattress. So will Rolene Strauss of South Africa holler next?